Who says you can’t have lasagna while watching your weight? 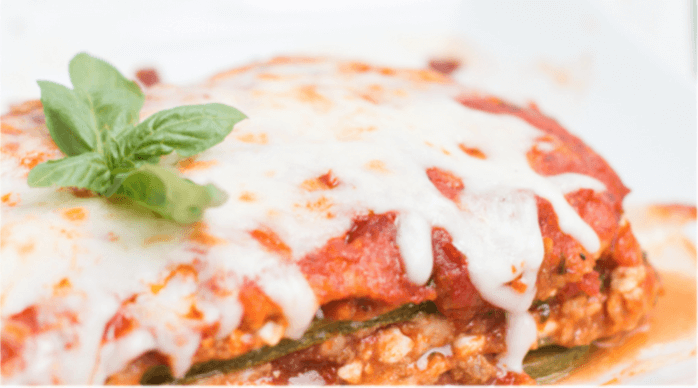 This lasagna is filling, healthy and even has cheese! Slice the eggplant and zucchinis into lengthy slices. You want to create lasagna with these vegetable slices. Sprinkle some salt onto the eggplant to extract extra moist. Set this aside. For the sauce, blend the peeled canned tomatoes. Fry the onion in some olive oil or coconut oil and then add the crushed clove of garlic. Add the minced beef and when it is browned, add the sauce. Lastly add the basil leaves (to taste) Let simmer for 2 minutes and set aside. In a baking/lasagna dish, put a layer of sauce and then a layer eggplant / zucchini. Repeat until the sauce and leaves are all used. Sprinkle the cheese onto the top layer.